Listen to your inner voice, always go with ‘Inge Yenna Solluthu…’! Neither insecurity nor pleasing others can make you happy! Of course, we offered this manager our perspective. But let me share with you our approach to such dilemmas – something that is applicable in all contexts, not just in professional or career-related choices. First, let us understand that in almost all cases, there is no dilemma. We are all pretty intelligent to know what to do in every situation. We invite confusion into our lives only when we feed our insecurities and when we try to please others. Simple. Gautham Vasudev Menon’s Vinnaithandi Varuvaya (VTV) had a great character Ganesh who would always egg the protagonist Simbu to decide only basis what his heart told him to do. “Inge Yenna Solluthu, Jessie, Jessie-nu Sollutha?” was the famous dialogue. Meaning, “What does your heart say? Does it say ‘Jessie, Jessie’…(then follow your heart, go after her!)”. Quiet similarly, for all of us, our inner voice has already spoken. The metaphorical Jessie has been pointed to. But we brush that voice aside and instead look at what-if scenarios feeding our insecurities. And we look at people around us and try to please them citing ‘what-will-they-say’ excuses. Neither insecurity nor pleasing others can make you happy. You are happy only when you are doing what you love doing. Listening to your inner voice alone can make you happy. Now coming back to the manager’s story, his inner voice wants him to take the entrepreneurial plunge. But his insecurity and his desire to placate, or prove a point to, his employer are causing his confusion. So much so that he’s refusing to see the opportunity of his entrepreneur-friend’s offer. All he needs to do is evaluate his options basis three questions: 1. Will I be happy as an entrepreneur? 2. Can I do justice to my job and my dream project while working for my friend? 3. Is there another source of income to hold the family afloat should the new job fall through for any reason? If the answer to all three questions is ‘yes’, well, he knows what to do! 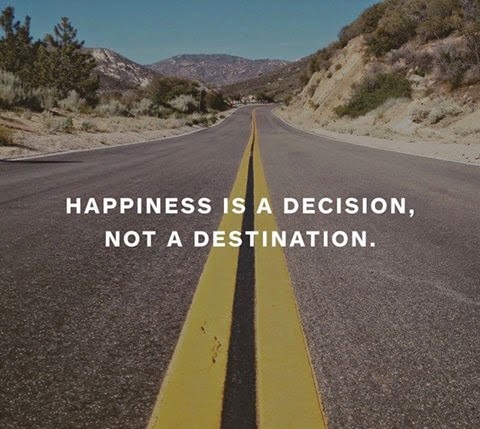 For you too, decision-making can be that simple whenever you start with asking what will make you happy. Of course not all decisions will get you what you aim for or want. But then Life is not about winning or losing, it is not about whether your decisions were right or wrong, it is only about lived experiences basis decisions made singularly on parameters relating to your happiness! Remember: it is not only what happiness is, it is also what happiness does. Happiness offers phenomenal clarity. It helps you realize that with each moment that you spend postponing happiness, you have not just one moment less to live, you have wasted one more moment being unhappy! In an unpredictable and inscrutable Life, what will matter in the end is, not who you pleased or what you fought, but how happily you lived despite your circumstances! Author AVIS ViswanathanPosted on January 9, 2017 January 9, 2017 Categories Happiness, Happiness is a Decision, Inner Peace, Intelligent Living, Life, Spirituality, UncategorizedTags Art of Living, AVIS Viswanathan, Dilemma, Entrepreneurship, Fall Like A Rose Petal, Gautham Vasudev Menon, Happiness, Inge Yenna Solluthu Jessie Jessie-nu Sollutha?, Inner Peace, Intelligent Living, Simbu, Unhappiness, Unhappy, Vaani, Vinnaithandi Varuvaya, VTV, VTV GaneshLeave a comment on Listen to your inner voice, always go with ‘Inge Yenna Solluthu…’!